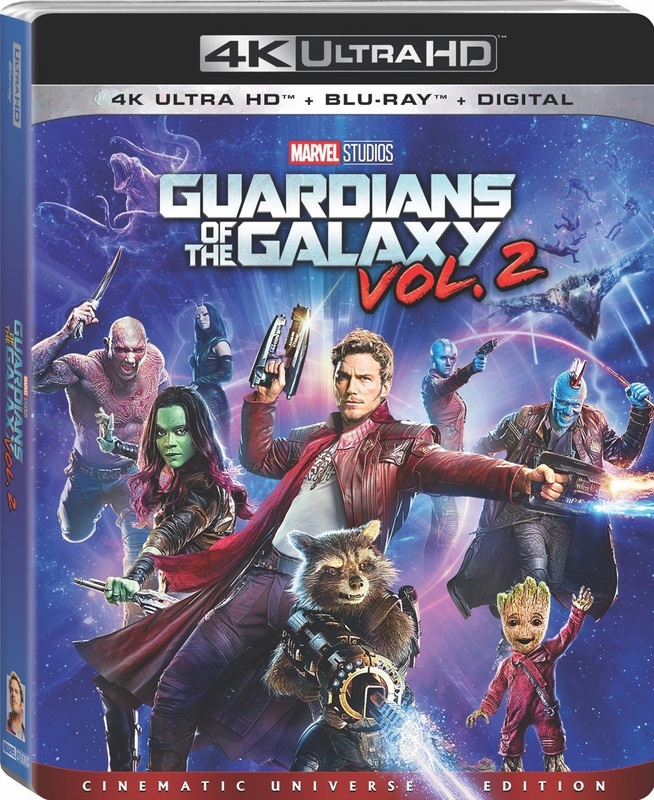 The Guardians (Chris Pratt, Zoe Saldana, Dave Bautista, Vin Diesel, and Bradley Cooper) must fight to keep their newfound family together as they unravel the mystery of Peter Quill’s true parentage. Disney has definitely come out swinging with its first 4K release. The colors are SO vibrant and impressive they’ll make you salivate. The UHD is so terrific and shows awesome skin textures in all the characters….especially Drax as well as being able to see lots of textures on fabric which makes everything feel a bit more realistic. Now with that said I will also admit that this format does make the film look a bit artificial in spots and kind of pushes me out of my suspension of disbelief. Either way, the film looks gorgeous in 4K and I really can’t wait to see what Disney has in store for the future. Visionary Intro – A quick intro by director James Gunn. He kind of lays out the film’s story and where it could go from here. Bonus Round: The Making of Guardians of the Galaxy Vol. 2 – This four part feature looks at everything from the stellar cast, special effects, the director and most importantly the music of the film. The Sneepers Ft. David Hasselhoff “Inferno” Music Video – A very hilarious music video featuring The Hoff and the cast of Guardians Of The Galaxy Vol. 2. Gag Reel – I already knew before watching this it was going to be extremely funny and I wasn’t disappointed. Deleted Scenes – Not too many scenes here but they are interesting to check out. They don’t provide any more to the story however. This entry was posted	on Wednesday, August 23rd, 2017 at 10:54 pm	and is filed under Reviews. You can follow any responses to this entry through the RSS 2.0 feed. You can leave a response, or trackback from your own site.